My dog, Murphy, sure likes to eat. He's a pug and they're known for their enthusiastic love of all things edible. If he had his way, he'd eat all day long. I noticed that Murphy was a few pounds heavier, but I didn't think the extra weight was affecting his health until an annual check-up became the wake-up call I needed. My dog, Murphy, sure likes to eat. He's a pug and they're known for their enthusiastic love of all things edible. If he had his way, he'd eat all day long. I noticed that Murphy was a few pounds heavier, but I didn't think the extra weight was affecting his health until an annual check-up became the wake-up call I needed. The vet told me the extra pounds on Murphy's small frame were harmful to his overall well-being and he needed to lose weight as soon as possible. Since then, I've made a number of changes to Murphy's diet and exercise regimen that have helped keep him at a healthy and trim weight. If your pet is on the pudgy side, I hope these tips help him slim down, too! I always used to eyeball how much food I fed Murphy, but when he piled on a few pounds and the vet noticed (oops! ), I realized I was dishing out too much. The vet suggested checking the portion recommendation on Murphy's dog food package and using a measuring cup to dole out exactly how much to feed him. No more guessing! Making this easy change has made all the difference in Murphy's weight. Just like with us humans, all of those tiny bites and extra calories really add up! Murphy is the type of dog who "politely" begs, so he doesn't whine or bark, but he stands right next to where I am preparing or eating food. 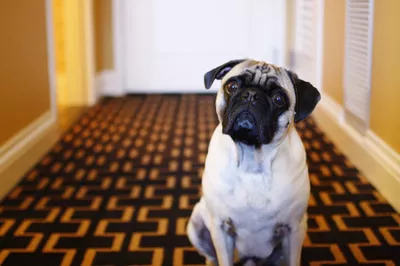 When I see his adorable pug face looking up at me, it's so hard for me to say no--same goes for the packaged doggie treats, which are often high in calories. Now when I want to reward Murphy, I stick to healthy treats like baby carrots and pieces of apple-- or just a belly rub. Helping Murphy lose weight required better eating habits and also some daily exercise, which, of course, is part of a healthy dog's life. Every morning, Murphy and I walk for 15-20 minutes and another 30-45 minutes in the afternoon. I love our walks together, and they're a great way to keep us both fit! Additionally, encouraging playtime with toys or a game of fetch is another way to keep pets active.